The City of San Marcos Development Services Department is inviting residents to participate in the Code Rodeo from October 23- October 29. This is the next phase of the San Marcos land development code rewrite project, and it’s your chance to help draft the details of the future code. Residents are invited to stop by any time during the day to provide input as details of the plans and code evolve. It is important to keep the natural infrastructure in mind during this rewrite, and we need you to share your voice in this support. Prioritized connections between various land uses current and potential, e.g. schools, businesses, neighborhoods, university, churches, community centers, cultural hubs, and identified intensity nodes. Other corridors as depicted in the Preferred Scenario Map that achieve continuous greenways from the Sink Creek Corridor to Purgatory Creek and the San Marcos River. 3. Priority should be placed on establishing standards for public improvements to dedicated parkland, e.g. neighborhood access, drinking fountains, adequate parking, restroom facilities. 4. Buffers between commercial, multifamily, and residential should be utilized for greenway connectivity where possible and not maintained as isolated parcels. 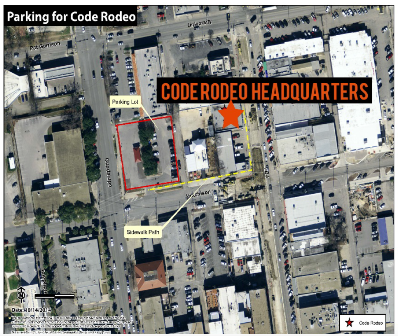 Meetings take place in the code rodeo headquarters next door to the Show Place Theater in downtown San Marcos on North LBJ. You are welcome to attend any and all of these events. If you have any questions, feel free to contact us at [email protected] We look forward to seeing you there!